From the time I was a young boy, I have been fascinated by the natural world, and consequently have wanted to our keep it as healthy as possible. I know I am completely part of the natural world. I know whatever affects the natural world also directly affects humans. This knowledge has been a driving force in my life. When I became aware of what was happening with climate change and the effects of burning fossil fuel, I was very motivated to do something about it. I have never doubted scientists who study the climate. Why would I? I have a good education and it taught me how science works. I respect and understand the rigorous research performed by scientists. 97% of the scientists who study climate change have proven the earth is warming due to carbon emissions from human activity, as well as deforestation. There is no question about that, unless you are trying to skew the facts. It was clear to me that changing the way we produce and use energy is an area where I can make a difference. I built a very energy efficient home in 2001, and I wanted to do more. In 2008 I started Ecohouse because I wanted to work every day to slow climate change and try to reverse it. When I first started Ecohouse, I focused on helping homeowners improve the energy efficiency of their homes by doing home energy audits and recommending improvements. In 2009, I put solar panels on my own home and loved the result. I then started to offer solar design and installation as an additional Ecohouse service. In 2011, the focus of the company changed. Ecohouse became Ecohouse Solar. 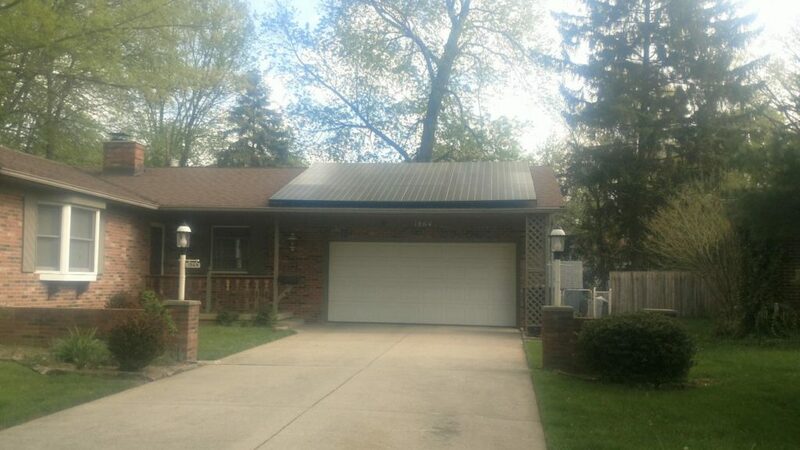 The employees of Ecohouse Solar still often recommend an energy audit for our customers, however we are now focused on designing and installing solar electric systems for homeowners and business owners in Central Ohio. Our solar business has picked up each year since 2011. In 2017, Ecohouse Solar installed over 45 solar electric systems. In 2018, we expect to install 60-70 systems and we hope to keep growing each year. We are motivated to reduce the amount of CO2 being put into the atmosphere, and solar is a great solution. It produces no emissions other than the minimal amount from its manufacturing and delivery of the solar equipment. Ecohouse Solar takes pride in getting better and better at our work. We work closely with our customers to answer their questions and explain the details of switching to solar energy. Our goal is for them to be proud of their solar investment. Let us help you make this transition to clean energy. We want to work together with you to slow down climate change. We can make it easy for you to reduce your carbon footprint and enjoy all of the great benefits of solar electricity. Contact Ecohouse Solar today.